The MP 8 looks small and inconspicuous. At first glance the casual observer may think it is just a classic CD player, but its true capabilities extend far beyond this. 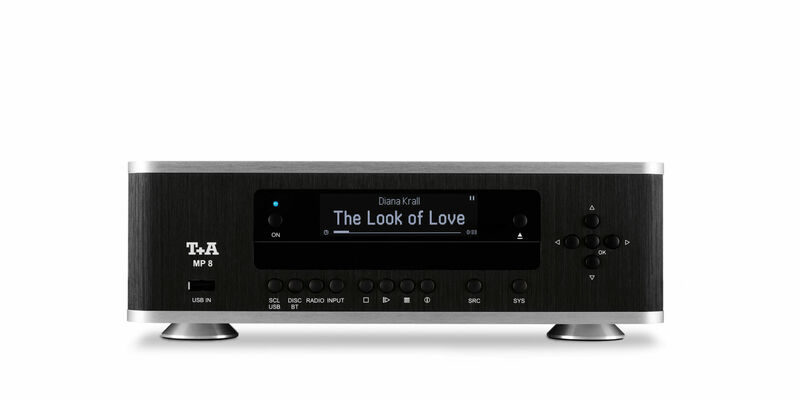 Our multi-source player houses a first-class CD mechanism; a high-performance digital tuner offering FM, FM-HD and DAB+ reproduction; a high-quality Bluetooth streaming module for receiving music from mobile devices, a streaming client with Internet radio and music services for connection to the home network via LAN and WLAN, USB Master Mode and HD streaming plus a digital connecting board with inputs for external sources (two USB device mode and three HD-S/P-DIF). The wide range of connections allows external equipment to exploit the machine’s superb signal processing to the full. Please note: the MP 8 is not a computer; it is a high-end audio device incorporating many supplementary functions designed to ensure that all modern digital sources can be used, reproduced and processed to a D/A converter in the highest possible quality. The MP 8 can provide any converter with high-quality audio data (up to 192 kHz) via its S/P-DIF output, but the perfect match is our DAC 8 DSD. The SYS OUT and DAC 8 LINK outputs are used to exchange control data and transmit audio signals with optimal routing to the DAC 8 DSD. When using the T + A App, the entire Series-8 system is controlled via the MP 8. The MP 8 delivers a stunning experience in sound reproduction, and finally exploits the full potential of digital music sources.